The Lord of the Rings and my Roleplaying Hobby - Disaster strikes! In the early 1990s I realised the reason why it was I had never tried to game in Tolkien's wondrous creation before. It was because I was a snob. I was trying to run a MERP game with a couple of players - post War of the Ring - but couldn't quite figure out why it was I wasn't enjoying the game. It hit me at the beginning of the second session; the players weren't playing the game the way I wanted them to. I had an image of Middle-earth in my head, the way everyone acted, spoke and basically presented themselves, and the players were not playing it that way. They were playing it the same way they played old D&D and WFRP games, speaking normally and messing around. They just weren't taking this amazing setting and world seriously enough. I'd even go as far to say that I was angry at them because they didn't have the same level of respect that I did for Tolkien's world. Crazy? Oh, yes, it was a crazy attitude to have but after more than ten years being brewed in my head it was going to be difficult to let go of the images and attitudes I thought should be present in a Middle-earth game. Before the game descended into madness I did exactly what my former MERP GM did; I changed the setting to a fantasy Europe. The games were considerably better and the campaign, though short, was a good one. This was a dilemma - how could I game in Middle-earth when the players involved didn't have the same approach to the setting as I did? Had I ruined any chance at gaming in my favourite fantasy setting? What I needed was something that would unite imaginations, make sure that we were all working from the same page and were approaching the game with the same attitude. This was why my Star Wars D6 games worked so well, because we all had the same visual and emotional attachment to the films so they were very easy games to run and get involved in. So when Peter Jackson's 'The Lord of the Rings' movies were released, and the Decipher version of the rules was published, I had my visual and emotional anchor. I thought I'd give it another shot. "Dead Gentlemen Productions is a group of filmmakers located in the Seattle/Tacoma area of the Pacific Northwest. Their recent film The Gamers: Dorkness Rising, is currently distributed by Zombie Orpheus Entertainment. Since then, Dead Gentlemen Productions produced several comedy sketches and short films, the high definition feature The Gamers: Dorkness Rising, and co-produced with Margaret Weis Productions, creating the Demon Hunters Roleplaying Game, containing the newly canonized world of their original Demon Hunters and a short film entitled: The Brotherhood Orientation Video. To this very day the Dead Gentlemen exercise their super power of unmatched collaboration to create projects together." I've been following these dudes since I first saw their feature 'The Gamers' on Youtube. I was instantly enamoured with the film and loved the concept of watching an RPG being played out in both the real world and the fantasy world of the game. Then 'The Gamers: Dorkness Rising' hit the net and I found myself totaly hooked. Recently I watched their live stage performance and right now I'm really enjoying 'The Gamers: Hands of Fate', their new 'Gamers' title released as webisodes. I think they should get a lot more attention, especially in the UK, and I'm trying to sort out the best way to screen their movies over here. I had a lovely time at the rather wonderful Titan Games this afternoon. I met two dudes called Mark and Rob from Prodos Games, and these guys are the driving force behind the new Warzone game 'Resurrection'. You may remember Warzone, and the whole Mutant Chronicles line, from the wargame and roleplaying game of the 1990s. I had great fun with the Mutant Chronicles roleplaying game; suited and booted big gun soldiers fighting mutated zombie undead from space? I'm a smoking hard-drinking long-haired party animal in my early twenties. Sold. The thing is, beyond the cool factor there was an excellent and well thought out background and a brilliant atmospheric setting. I played it for a good long while. You can read more about the setting at the Warzone website. The models and demo I saw today was for the wargame and the system seemed really quick and easy. Using only 20-sided dice, rolls to-hit were made against a target number or lower (so, to hit with a certain figure might be 14, so you have to roll 14 or less to hit). A hit does a wound, and to protect against a wound you roll against an armour save, again a certain number or less on a D20 (in this case,the guy had armour of 12, so had to roll 12 or less to save against the wound or boom - death). There are cards you can play which enhances rolls or gives you another chance (the effects varied but this was a simple demo game), and other rules besides. 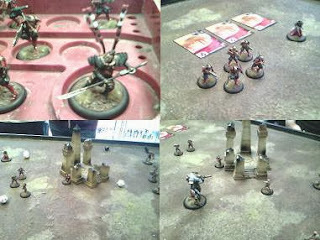 In the game that I watched, presided over by the dudes from Warzone, two completely new players got a decent fight on the go with about seven figures each side, and after six rounds of combat - which took about half an hour - the victor was the Necromutants, and Mishima were the losers. It was quick, fun and the players had a great time. I certainly had a good time watching. The models are well detailed and of very high quality, and they looked great painted up. I just wish I had a better camera with me. Look out for more reports on this game in the future - I think I'll be keeping my eye on this one. The world of Mutant Chronicles definitely deserves another stab at the hobby. ... and it's time for me to create a new D&D campaign. I think the Realms will be a good fit for 13th Age. I've already decided to set it pre-spell plague, or whatever the hell that was, so I've bought it back a hundred years to play it as I remember it when I was reading the Icewind Dale and Dark Elf books. I'm determined not to have anyone play introspective Underdark dwellers with scimitars. Not a freaking chance. I'll be designing it the way I used to - that means listening to Beethoven and Wagner as I write, I do it all longhand without computers and I used hex and square pads to design maps, locations and dungeons. I've not done it that way for twenty years so it should be interesting. I might drop the Icon part of the 13th Age for now and just run with background skills and the One Unique Thing. The group didn't really want to do anything as detailed as Pathfinder or as simple as Basic D&D, so I reckon this will be perfect. My love affair with The Lord of the Rings began when I was in the third year of school. I was eight years old and it's one of the things from childhood that I vividly remember*. 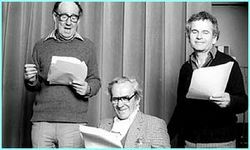 Every week were made to sit in groups around a tape recorder that had about six huge, clunky sets of headphones plugged into it, and through this we were subjected to the BBC radio dramatisation of 'The Lord of the Rings', all 26 wonderful, magical parts. It was the most exciting few weeks of my school life as I became immersed in this incredible world of magic, monsters and heroes of all sizes. And that was it. After finding out that we had copies of both the books at home, The Hobbit and The Lord of the Rings, I set about reading them from cover to cover and savouring every page, and I also did my best to record the BBC drama on an old radio cassette player. And that was it. I declared my love for all things Tolkien and as the years passed by my meagre collection grew and grew. Roleplaying in Middle-earth never truly started until the late 1980s, and even then the games never really delved into the richness of the world. I'd been playing fantasy games since 1983, roleplaying since 1984, and even though I immersed myself in the fantasy worlds of the game I never had the chance, or really the urge, to game in Middle-earth. Tolkien's world never had the plethora of monsters that the D&D worlds have and I was having fun making my way through the beasties of the books, and exploring whole new fantasy worlds such as Titan, Forgotten Realms and several home-brewed locations of varying quality. I began to play once a friend of mine got his hands on the Middle-earth Role Playing game - MERP - and I created my first ever fully-fleshed and detailed player character, Tere Swordsong. It was with this character that I was able to finally understand the creative power of roleplaying games and I allowed myself to become fully attached to the character. It was an amazing adventure and I was giddy with excitement when I walked through the doors of The Inn of the Last Bridge in the Trollshaws, and I finally began to roam the lands I loved so much. 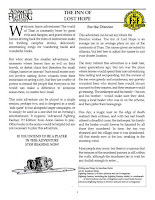 The divergence began when the gamemaster began to create adventures that became bigger and bigger in concept, and began to affect not just my character or the location but the world as a whole. We were both wary of contradicting established Tolkien lore, probably I was more than him, and so it was then that he decided to change it form Middle-earth to a general fantasy Europe. As it turned out, it was a great choice. Now he could bring in all kinds of monsters and bad guys and have full control of the game, without any second-guessing or worrying about what was right or wrong in Middle-earth, and he didn't feel hemmed in or restricted by the setting. The time I did spend in Middle-earth was incredibly gratifying and the fact that it also enabled me to finally get under the skin of a player character and play him to the hilt was a vital turning point in my roleplaying hobby. Every character I have created since Tere Swordsong has failed to recreate that feeling I got when playing him and, even though I played the characters as well as I was able, they never measured up. It is strange that, considering my love for Middle-earth, I never spent much time gaming there. I could never figure out quite why that was, not until I ran my own somewhat disastrous MERP games in the mid-1990s and realised fully why it was I had shied away from it. *I obviously don't remember it that well - it was actually 1981 and I was ten years old. 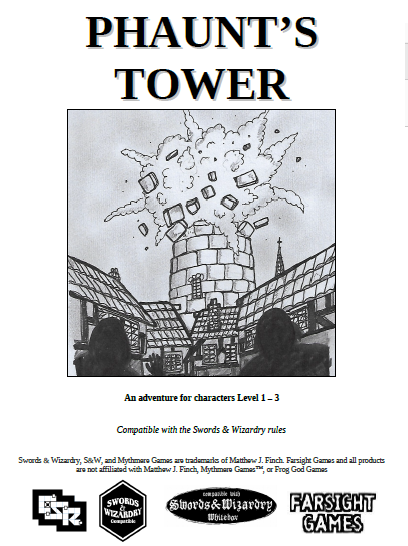 Please welcome to Farsight Blogger Steve Turner, the man at Brittannia Game Designs and the gentleman who procured the licence for the classic fantasy roleplaying game 'Chivalry & Sorcery'. 'Chivalry & Sorcery is a fantasy role-playing game that was first published in 1977 by Fantasy Games Unlimited. Originally created by Edward E. Simbalist and Wilf K. Backhaus in 1977, Chivalry & Sorcery (C&S) was an early competitor to Dungeons & Dragons. 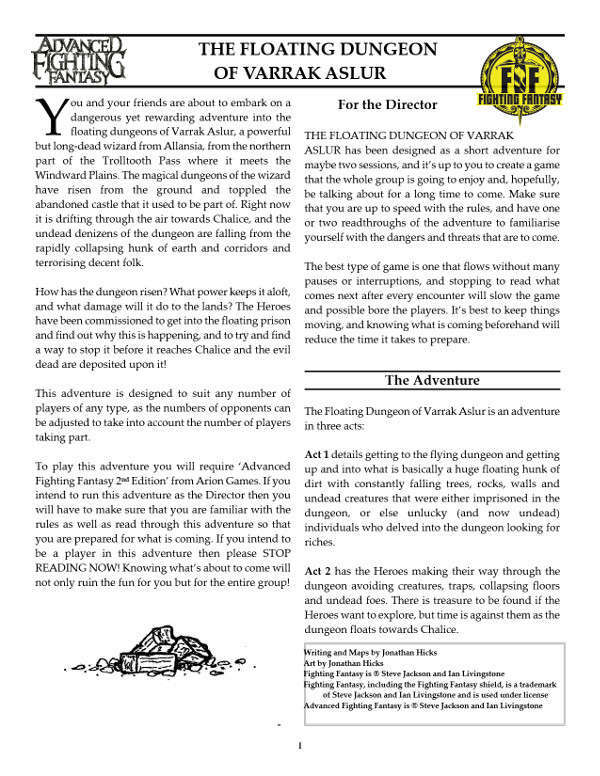 Historically, the two designers of the game were dissatisfied with the lack of realism in Dungeons & Dragons (D&D) and created the first gaming system derived from it, which they named Chevalier. They intended to present it to Gary Gygax at Gen Con in 1977 but changed their minds once at the Con, where they met Scott Bizar who wrote out a letter of intent. After some final changes to get rid of the last remnants of D&D (e.g. 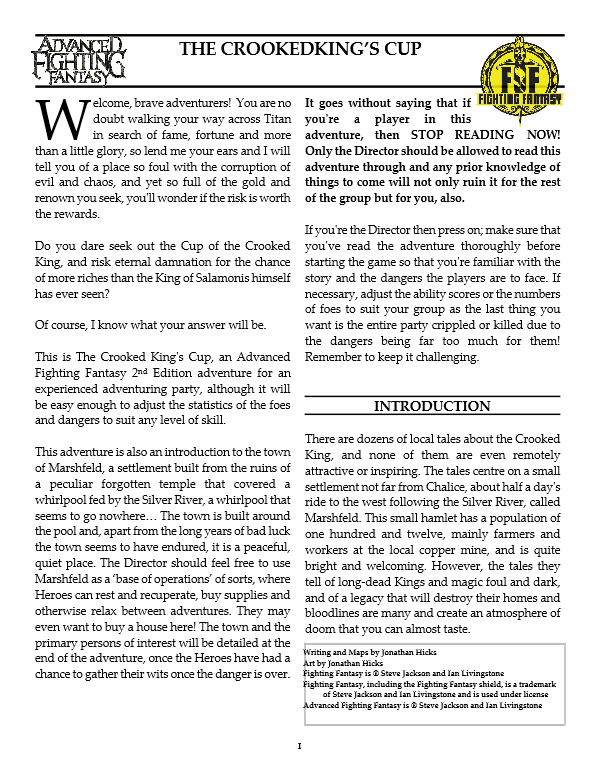 the game contained a table of "Saving-throws" similar to D&D), Simbalist and Backhaus published the first edition of their game - now renamed Chivalry & Sorcery - shortly after the release of the first edition of Advanced D&D. According to Michael Tresca, Chivalry & Sorcery "embraced a realistic approach to medieval France in the 12th century, complete with feudalism and the Catholic Church. Chivalry & Sorcery was most noteworthy for creating the term "game master." It was one of the first games to place the setting at utmost importance over the mechanics of the game." More focused on medieval chivalry than fantasy, Chivalry & Sorcery (C&S) had from its first version a sophisticated and complex set of rules. The game has been published four times to improve its presentation and to modernize its game mechanics. C&S was the first to introduce new concepts like levels for monsters. The game was reissued by Highlander Designs but when they went bankrupt it was bought by Brittannia Game Designs Ltd. (BGD), a company based in England and directed by Steve Turner. The fourth edition of C&S, called "The Rebirth" was born a few months later. The result was the return of some medieval references and some gameplay mechanics (such as "bash" or "Targeting" for spells) adding this degree of realism that was lacking in the previous edition. Moreover, many additions to the rules (such as "Laws of Magick") brought novelty to the game. I am rapidly approaching 50 and have been gaming for 40 years or thereabouts. As well as running Brittannia Game Designs Ltd (more on a part time basis) I also run Turbo Business Services Ltd, an Accountancy Services Provider for small business. My background is 30 years in Credit Management and debt recovery. I am also learning to murder songs with my guitars (my mid life crisis). I started our gaming as a wargamer using Airfix miniatures moving from WW2 to Ancients via Napoleonic. Then in 1979 I was introduced to the GW print of AD&D and thus began my forays into RPG (although my wargaming heart still beat strong). The whole excitement of first person adventuring into the unknown was a big attraction. Over the years the group of friends I gamed with spread their wings into other systems, Chivalry & Sorcery, Traveller and many others. In 1982 out of one game came the first scribbles that became the Dragon Reaches of Marakush (DRM). I then became involved in UK Gencon writing scenarios and GMing tournaments. This led to me becoming an RPGA Regional Director, one of the remits being to run a local convention. Thus was the "Dudley Bug Ball" conceived which ran for a number of years culminating in a three day residential con at the Hilton Metropole NEC in 2002. It was during this time that C&S was brought back with third edition and I approached the then owning company with a view for a licence for supplements. We produced and released DRM and then found out the owners of C&S were in difficulties. We managed to secure the IP and bought the game to the UK. Following the last DBB my wife and I were suffering burn out so we stepped back into the shadows. Following a hiatus and a need for a break from RPG gaming I went back to miniatures with GW. Then in the last couple of years with the changes in POD and the likes of Drivethrurpg we decideded to start dusting of old manuscripts and start producing again. What attracts me to Tabletop RPG is the sheer variety of what you can do in so many settings, and the social aspects, the chance to meet up with friends and chat over drinks and food. 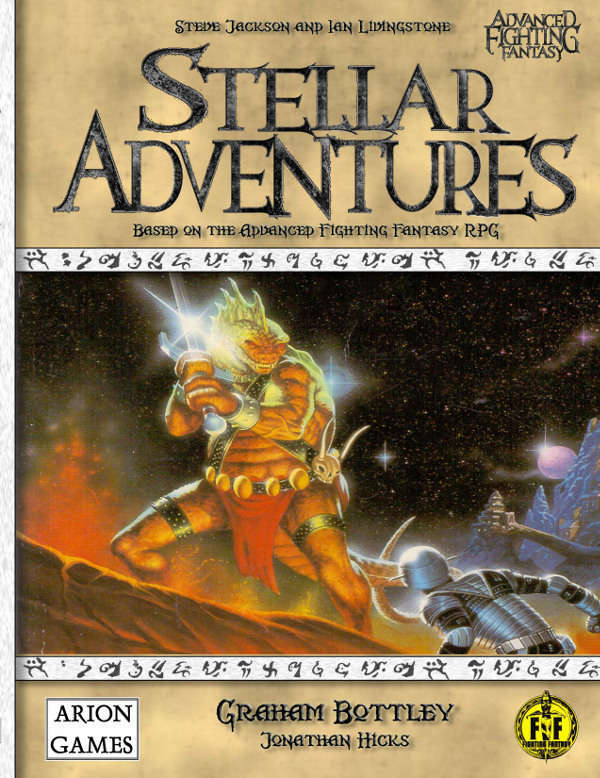 My favourite games over the last 30 years have been C&S, Call of Cthulhu, Harnmaster, Traveller, Savage Worlds, Leagues of Adventure and Star Wars. I manage to game twice a week, currently playing Star Wars Edge of Empire, various Savage Worlds and look to run Leagues of Adventure. I also currently play Flames of War, WH40K and looking forward to some Kickstarters that are due the end of this year. I dont see the RPG hobby dying anytime soon. This can be seen by the uptake on kickstarters. However, from a publishers viewpoint there have been many changes. The notion of printing, selling to wholesalers etc I dont think is sustainable in the long term for small publishers. POD through outlets like Drivethrurpg or as co-operatives like Chronicle City is going to be the way forward. Small Publishers are now being forced to deal direct with the end customer or Bricks and Mortar Stores as distributors do not make it financially viable to deal through them. 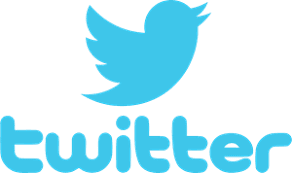 This is going to make word of mouth via the internet and social media more important than traditional advertising. Out of all of our projects I am most proud of the Dwarves and Elves racial supplements, the cover art worked so well and Wiggy's writing is superb (as can be seen with how well his own company Triple Ace Games has fared). I am also proud of C&S Rebirth (C&S 4), although I do feel it didn't quite hit where I would have liked it to have reached. We hope to rectify this with 5th Edition. Tell us more about Chivalry & Sorcery, it's history and where you are with it at the moment. What was the attraction in acquiring and developing the game? Well, C&S has a long history. Suffice to sat we now have our hands on the game which is a registered trademark. The future looks strong with our ongoing print partnership with Chronicle City. 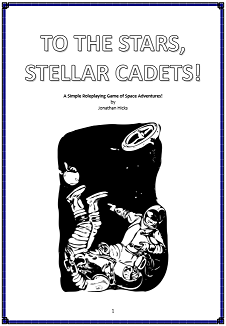 The main attraction for acquiring C&S was the history of using the 2nd edition for DRM, my original campaign, and being in the right place at the right time. Also, the chance to mould an exisiting recognised game system with the addition of a british twist (correct spelling of English for a start). Future plans include getting 5th edition out there, and polishing the many other manuscripts that we have waiting to be worked on. What is against us is time, not enough of it. We can be found on Facebook and also at Drivethrurpg. 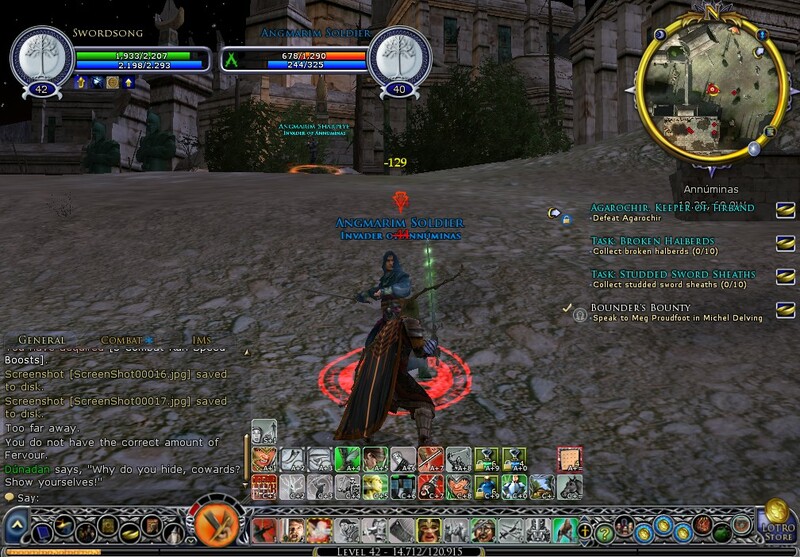 I've been playing a lot of Lord of the Rings Online this year and I've concluded that it's the best free-to-play out there at the moment. 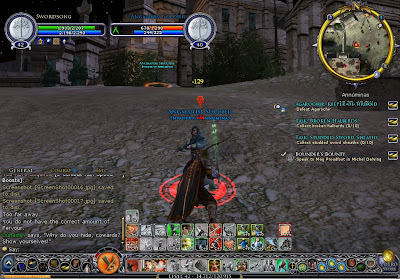 I'm a huge Lord of the Rings fan, I've been following it since the late 1970s, so an MMO based on the property had a lot to live up to as far as I was concerned. 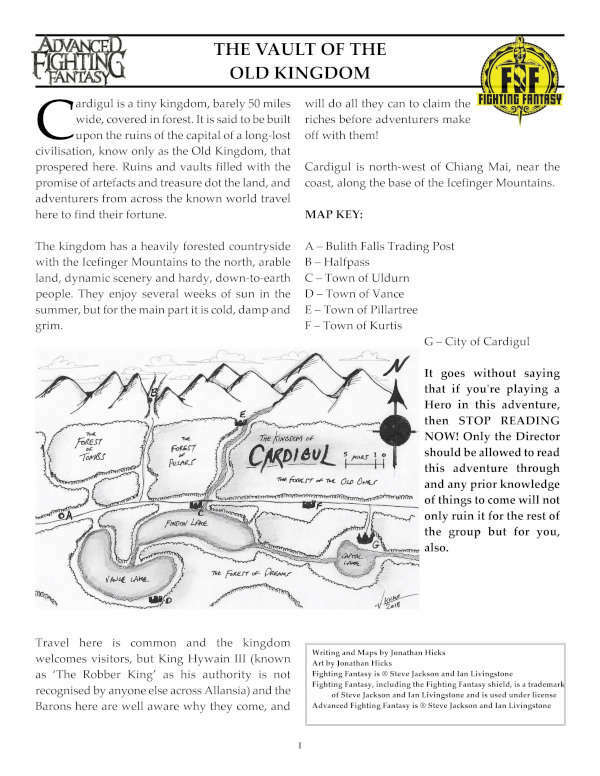 I'll be writing a series soon regarding this; why I played it, my history with Lord of the Rings roleplaying (from MERP to Decipher to my own Dragon Warriors and Cthulhu: Dark Ages versions), what Lord of the Rings means to me and why it's a great game for lovers of these kind of online RPGs to get involved in.